Football Manager was born and belongs on the PC – but actual ball-kicking simulators have been hamstrung lately by a tendency to limp along behind their console equivalents. In an odd year where developers are straddling consoles old and new, PES 2015 will continue that trend. On PC, it’ll be a “hybrid” of its current and last generation console versions. 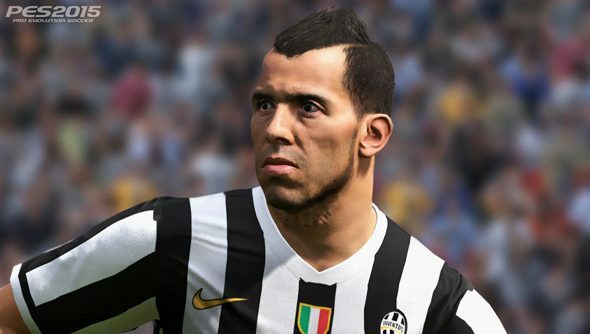 Development of PES 2015’s PC version was driven by “accessibility and quality”, PES European brand manager Adam Bhatti told Twitter followers. We can expect the “same modes and gameplay” they’re getting on PlayStation 4 and Xbox One – and “better visuals” than those seen in PES 2015’s PS3 and Xbox 360 versions. But overall, the game will be “a hybrid really”. Light and texturing in the PC version will be “different” from its new-gen console equivalent – i.e. of a lower technical standard. But Bhatti argued that “both look great” and the PC version is “still awesome”. We can’t judge the demo just yet: it won’t be available till September 17 – just a week before the powerfully emotional FIFA 15 is released. PES 2015 itself is due on November 13. When was the last time you thought about the proudly unofficial football series?